The 107a is a little less common than the 107 prime state, with the prime state having a few more high grade examples. 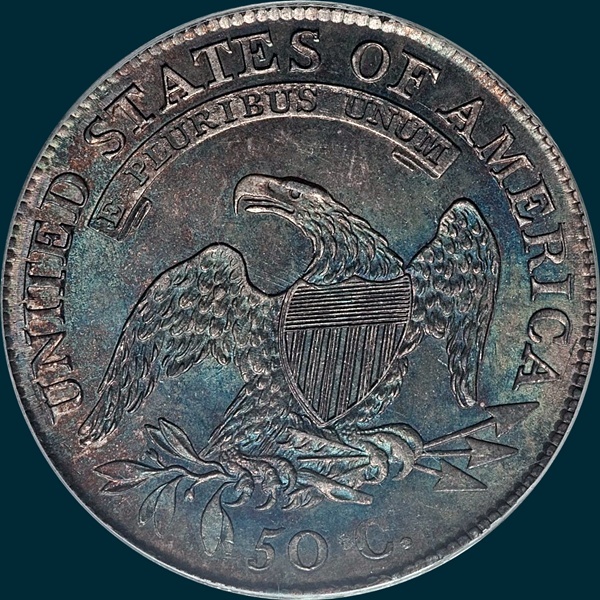 Somewhat common overall, available at least in the early die state up to MS65. 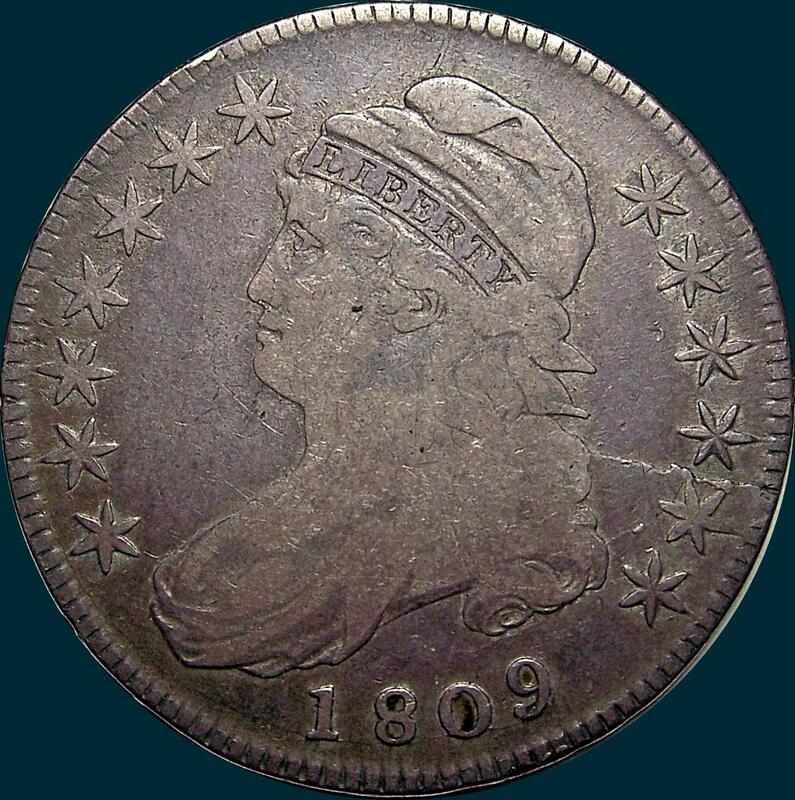 The later die state is coveted by collectors, having many interesting die cracks on the obverse. Variety Attribution: Obverse-Stars all large and well formed. Star 13 is 1/2 mm. from curl. Date is 9 1/2 mm. well centered with 18 about twice as far apart as 809. Some specimens show incused segments across cap. O-107a: There is a heavy horizontal die break from milling between stars 11 and 12 across curls into field above date to drapery left of 8. A finer branch crack from this break runs down through star 12 to curl. Another from first crack to cap. Some show a crack at date left to edge at star 1. The below example has all the crack. Reverse-50 C. is 1 3/4 mm. and well centered. Arrow to A is 3/4 mm. A rough and more or less round lump or mound is just to left of curve of C. Arrowheads are separated. AM are even and lightly joined at base. Right side of D is centered over stand of E. Fine straight lines radiating from inner curve of eagle's neck and left wing are visible on better specimens. O-107a: Triple and quadruple rows of small segments embossed between letters of AMERICA, arrow points and in field between AMERICA and right wing, all point in toward eagle. On some specimens the top right serif of I in legend is filled. On the example below, the I is filled. Former ANACS Graded VF20 (now in an NGC VF20 holder). 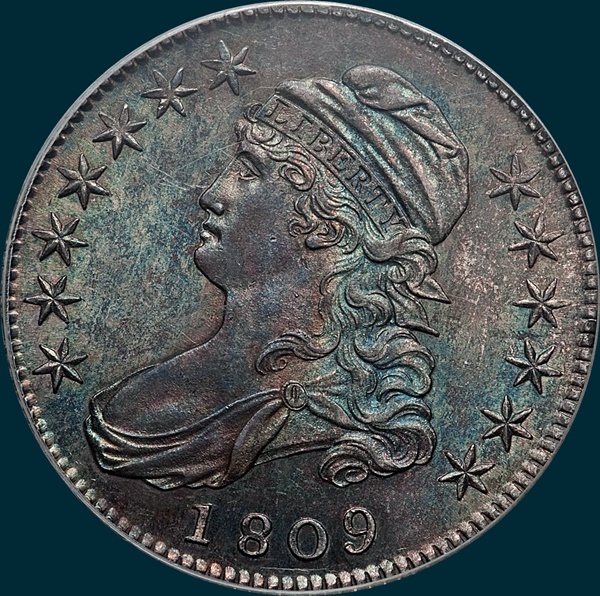 Fascinating coin. 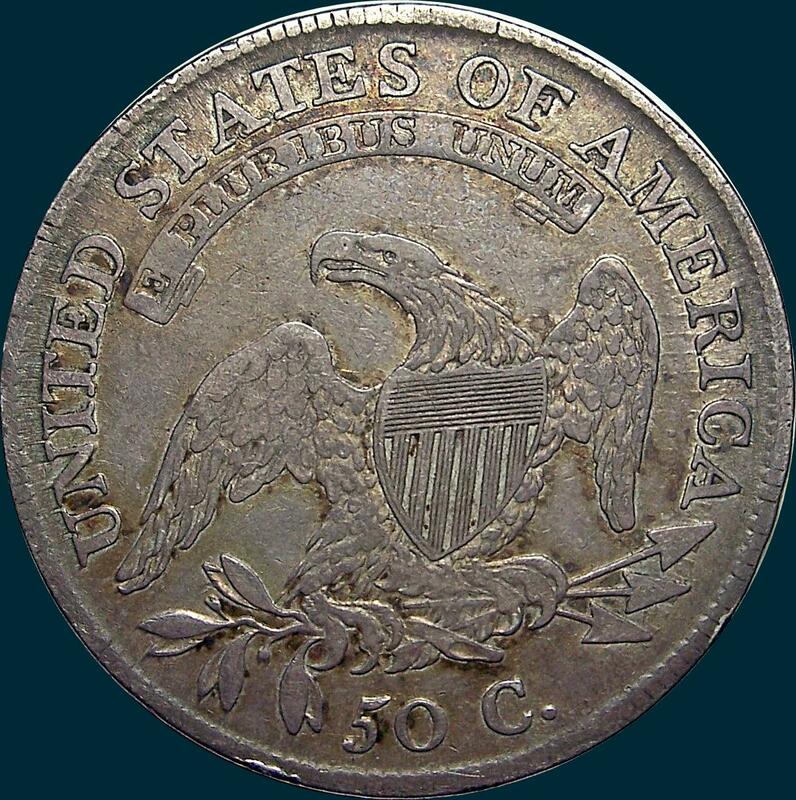 Lay this one down on a flat surface with the Eagle facing up and you will be able to rock the coin back and forth in all directions, indicating that the center of the obverse on this coin is raised up in a convex sort of way. Grayish brown toning with gold highlights. Some luster remains in the devices. Edge is detailed below. Note how DOLLAR and FIFTY run together, and there is no space for the IIIII. This would be caused by the movable die in the Castaing machine being started too far back from the starting position. Many letters exhibit signs of die wear and are difficult to read. CENTS above and OR below are difficult to read, and there is an "edge cud" at this edge die state, denoted by the blob after OR.